Prediction of the function of a new enzyme based only on its sequence, or even on its structure, is still a major challenge, and will be a major prize for biomedical research when effective methods are developed. Researchers at NYSGRC, in collaboration with the Enzyme Function Initiative, are addressing this challenge by studying several classes of enzymes. 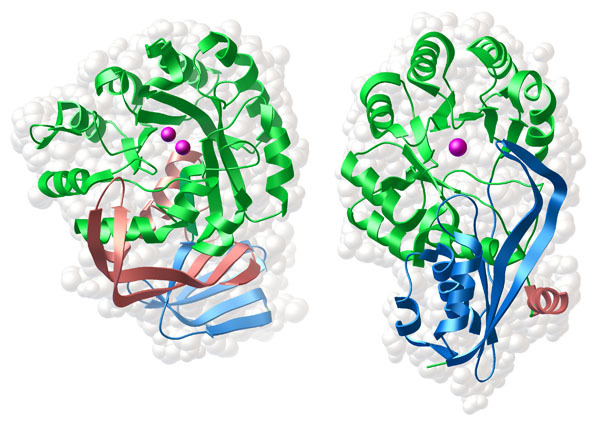 They began work on two superfamilies--enolase and amidohydrolase (shown here)--and have recently expanded the study to include three additional superfamilies: glutathione transferase, haloalkanoic acid dehalogenase, and isoprenoid synthase. By focusing on these superfamilies, and solving structures of many members with very different functions but similar structures, they are able to tease out the characteristic features that define the function, and separate them from the features that are important for other aspects, such as structural stability. The enolase enzymes and the amidohydrolase enzymes share a similar fold. The bulk of the chain forms a typical alpha-beta barrel, like that first discovered in triose phosphate isomerase (shown here in green). The two ends of the chain then associate to form another domain on one side of the barrel (shown in red and blue). The active site in both cases is found at one end of the barrel, where all the loops connecting the alpha helices and the beta strands form a substrate-sized cavity. Both superfamilies capture metal ions in their active sites to assist with the reaction. Two examples studied by NYSGRC are shown here, from PDB entries 2ics and 2ozt. These simple folds provide a wide range of possibilities for function. In order to study this diversity, it helps to have a large dataset of structures to compare. As part of their structural genomics effort, NYSGRC researchers have solved new structures of dozens of unique members of these two superfamilies. Several members of the amidohydrolase superfamily are shown here, from PDB entries 2paj, 2i5g, 2gok, 2q01, 2ogj and 2qs8. 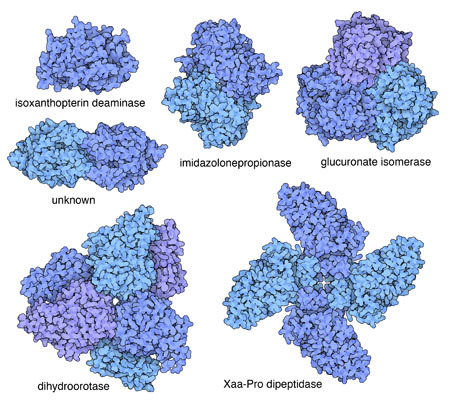 In these examples, a similar fold is used to build enzymes with widely different quaternary structures and entirely different functions. 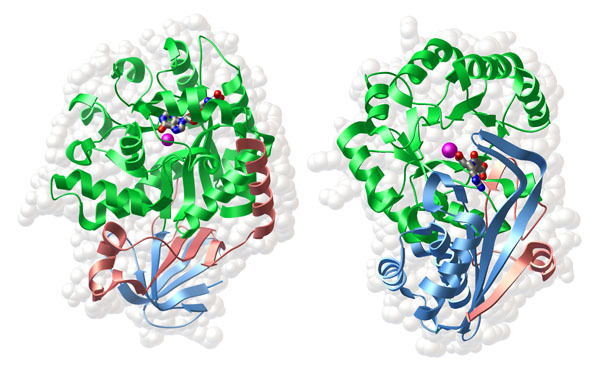 To discover the function of the enzymes, the Enzyme Function Initiative is attempting to predict the substrates, transition states, and products that bind to the enzyme active sites, using the structures solved by PSI researchers. They have had two early successes, using a variety of computational methods for docking small molecules and accounting for flexibility in the enzymes. Using these methods, they discovered that one of the new amidohydrolases is an adenosylhomocysteine deaminase, and one of the enolases is an N-succinyl arginine racemase. Subsequence crystallographic structures of these enzymes in complex with their substrates, shown here from PDB entries 2p8c and 2plm, confirmed the structural details of these functions. By looking at many structures from different organisms, we can discover how the different enzyme functions were evolved. Since the enzymes within each of these superfamilies share a similar sequence and similar fold, they are thought to have diverged from a common ancestor protein. Other unusual evolutionary relationships have also been found. The two enolases shown here, from PDB entries 3dg6 and 3dgb, perform a similar reaction, but do it in stereochemically opposite ways, attacking the substrate from opposite directions. This is thought to be an example of pseudoconvergent evolution, where two different enzymes in the superfamily individually evolve to use similar methods to do the same job. To take a closer look at these enolases, the JSmol tab below displays an interactive JSmol. Gerlt, J. A. et al. The enzyme function initiative. Biochem. 50, 9950-9962 (2011). Pieper, U. et al. Target selection and annotation for the structural genomics of the amidohydrolase and enolase superfamilies. J. Struct. Funct. Genomics 10, 107-125 (2009). Sakai, A. et al. Evolution of enzymatic activities in the enolase superfamily: stereochemically distinct mechanisms in two families of cis,cis-muconate lactonizing enzymes. Biochem. 48, 1455-1453 (2009).